Yikes!! 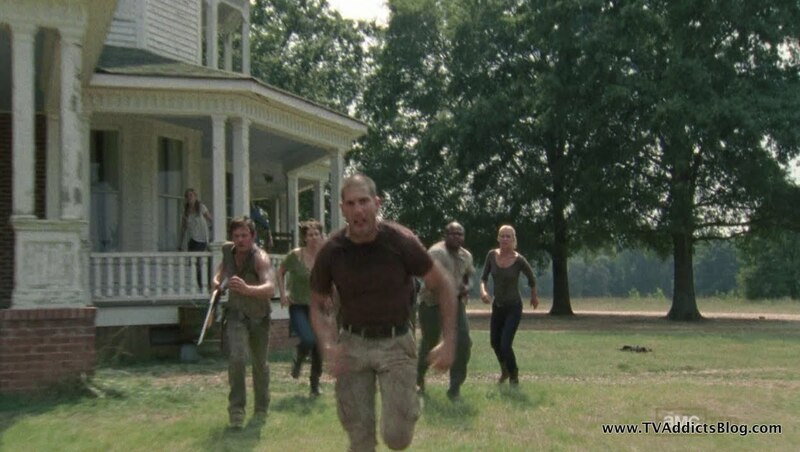 Hello Walkers!! Well, is this the episode everyone was waiting for? I'm sure it was. Brilliant from start to finish and wouldn't have been half as impactful without the 6 episodes and pacing that led up to it. (not to mention the 6 episodes of season 1 that added to it as well) All of these emotions and conflicts between characters brewing and culminating in one grand shoot-out. And if that wasn't enough, a horrific conclusion to this season's long running story arc that frustrated many viewers. That my friends could have been a season finale, but it was just our "MID-Season" finale! We're on hiatus until February 12, 2012 but there's plenty to discuss and debate until then. So, let's dive in and get started! We just thought last week’s episode was emotionally intense with all of the “secrets” being outed, right? Well, let’s just call this episode “Shane’s Awakening” because he went on a total rampage. And the worst thing about it was that even when most people want to take a gun and pop the loud mouth once and for all, most of what he is saying is very true about surviving in this new world. There have been hints of this blow-up since the beginning of this season (even fragments of it last season). Hold onto humanity or Keep Surviving? Glenn provides the catalyst in this episode for the latter to start moving ahead in the race. 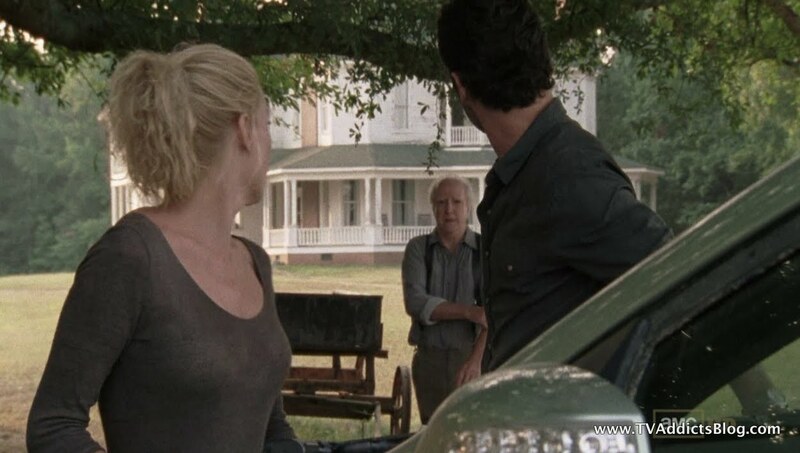 You gotta love the head nods and shakes from Dale and Maggie, each advising Glenn to do something different. 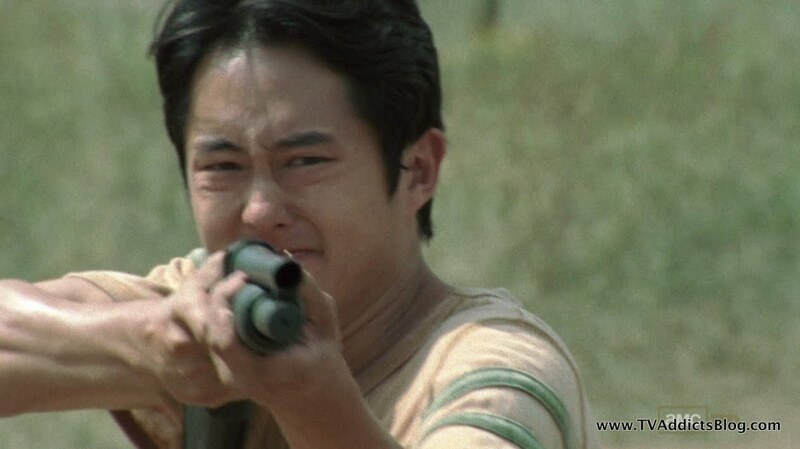 But, in the end, Glenn knew what he had to do. He awkwardly mentioned to the camp of survivors that the barn is full of walkers. And thus, all hell broke loose. Get used to this face! Shane and Rick could agree that hoarding a barn full of walkers is not a healthy habit. But Rick tried to maintain the high road. They are guests and need to reason with Hershel rather than take things into their own hands. 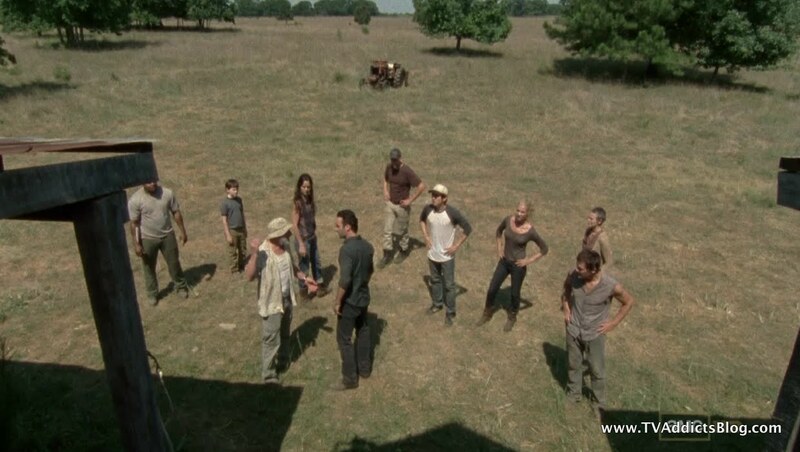 They want to stay on this farm and Hershel isn’t keen on keeping them there. 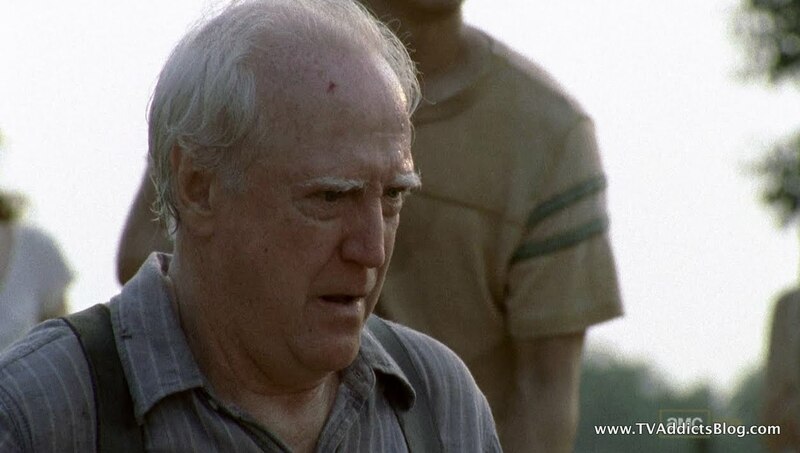 Dale threw his hat into the ring and let the group know that he talked to Hershel and explained Hershel’s opinions of the Walkers and how they are just sick living human beings. 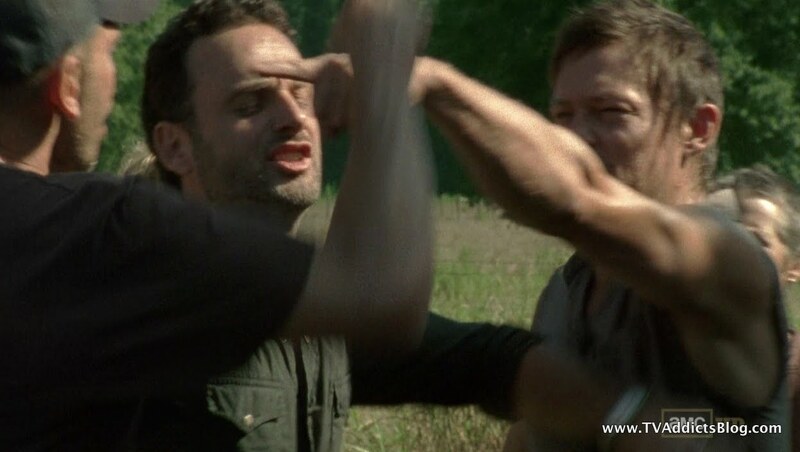 You can just feel the anger brewing in Shane, but ultimately for the time being, Rick is going to try and negotiate with Hershel. And Shane is just going to stare angrily at the barn. Everyone had their opinion of what the next move should be and many characters had their moments to shine. Here’s some highlights. Well for starters we learned that Carl’s “schooling” hasn’t stopped during the Zombie apocalypse. You’d think that would be the one benefit of the end of the world. Vacation all the time! Anyway, Carl made it clear to Lori that he did not want to leave this farm until they find Sophia. 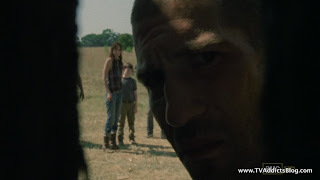 It was also implied that Shane pretty much assumes that Sophia is dead at this point ant they need to move on. Dale and Andrea finally had a talk. Andrea pretty much implied that she and Dale are fine now. Things are different now, she seems happier. Of course, Dale is not happy with the turn of events. Andrea’s delight has come from finding her purpose with a gun and being more like Shane (not to mention on top of him). Andrea mentions that she doesn’t mind being more like him because he’s not a victim. 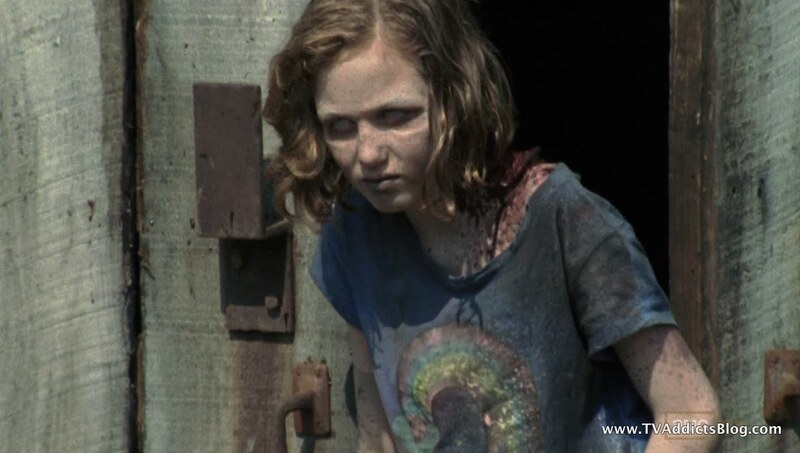 She leaves for a planned Sophia search with Rick. Meanwhile Dale, who warned Andrea that she may not fully know Shane, is assuming the worst is coming with a fuming Shane, He asks Glenn to go get him some water while he keeps watch. But Dale was just using this as an opportunity to go hide the guns in the woods. 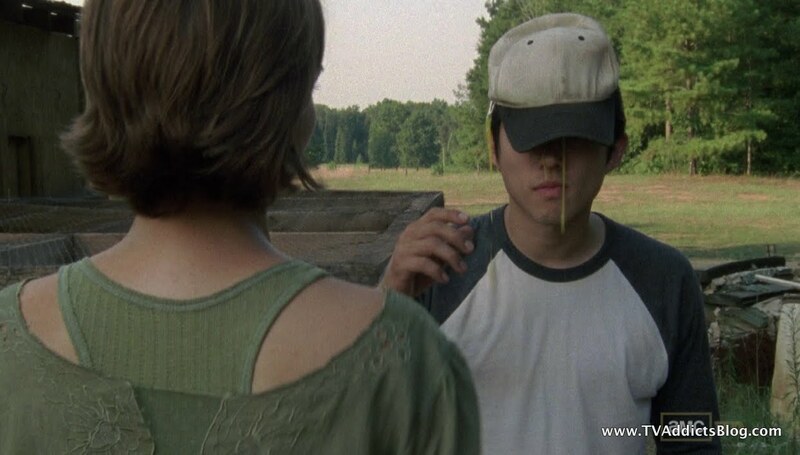 And Glenn? Please don’t ever wear Dale’s hat again! 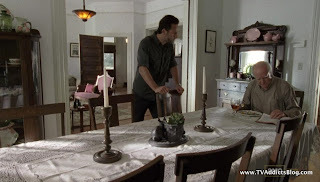 Rick finds Hershel having “Bible Time” with his lunch in the house and tries to reason with him one more time. He offers the group’s help around the farm if they would let them stay. He admitted to knowing about the barn and to their differences on the Walkers. But he begged Hershel to not send them back out there. 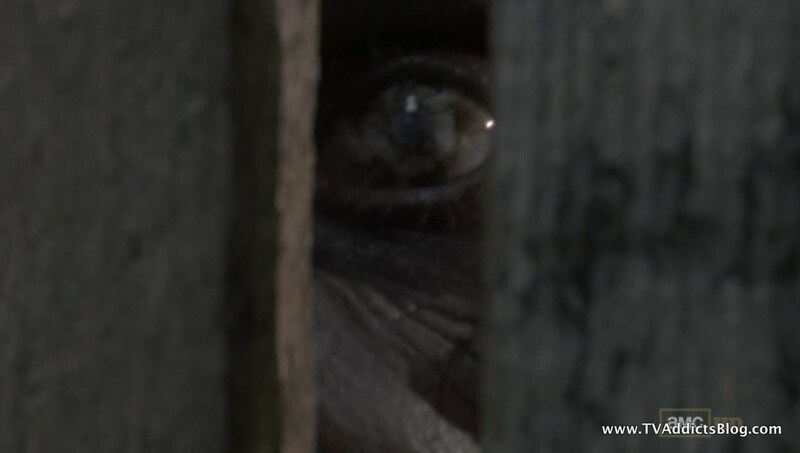 Rick believes that Hershel’s philosophy on the walkers is misguided due to being sheltered from most of it. The television news stopped before things got really bad. He brought up Lori’s pregnancy and how sending them out there is a death sentence. 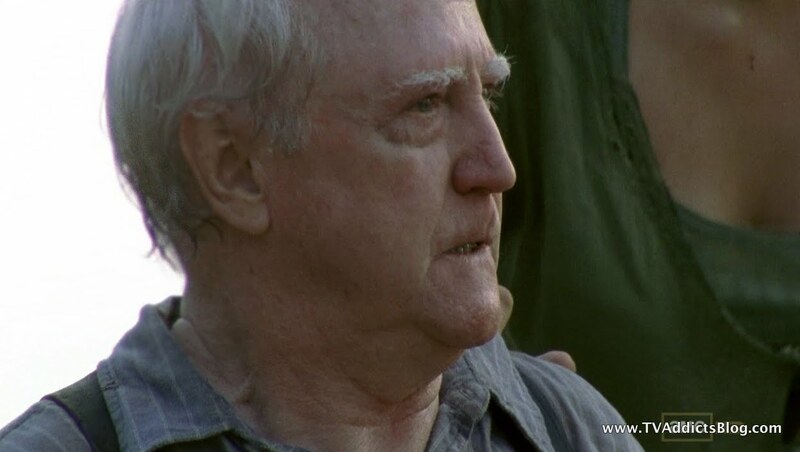 But Hershel’s resolve remained. He wants them gone by the end of the week. Cue Maggie watching the whole conversation. Maggie tried to use some Gospel Speak to get to Hershel. Hershel apparently has had some interesting love affairs in the past. He left Maggie’s mother for someone named Annette. Maggie was 14. He had told her to “love one another as I have loved you” and compared it to the current situation. Hershel didn’t want to admit that it’s the same. So he just assumed it was about “Asian Boy” which really set off Maggie. She told Hershel how Glenn saved her from a “WALKER”. 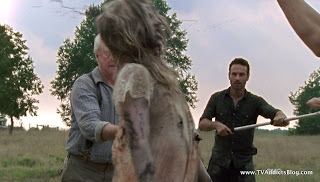 How Hershel’s “SICK PEOPLE” tried to kill her. The argument would have kept going if he wasn’t interrupted by another issue (more on that in a bit). Rick updates Shane on the negotations with Hershel. Shane is furious. 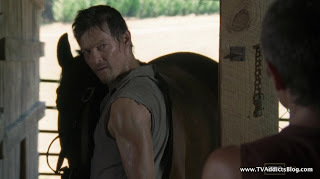 He tells Rick if they're not going to clear out the barn then they have to move on. Rick then is forced to tell Shane that Lori's pregnant which catches Shane off guard. But it stengthens his resolve even further that they need their guns and need to take action. 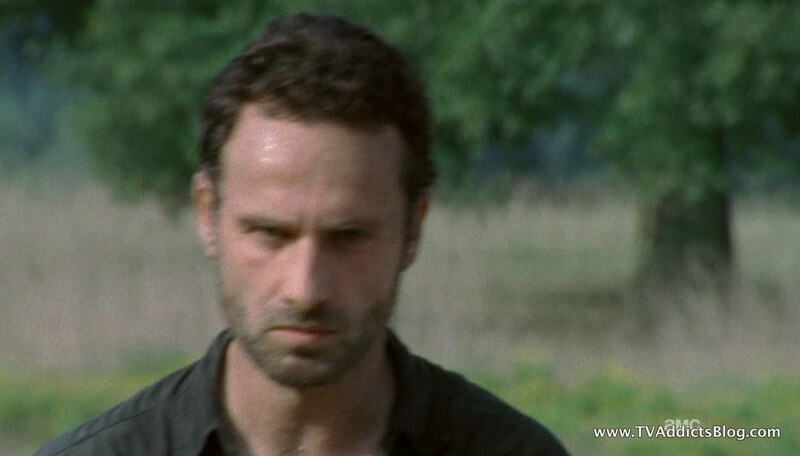 Rick maintains that he will continue his negotiations with Hershel. Shane and Lori have their discussion recalling all of the show’s history in a couple minute conversation. 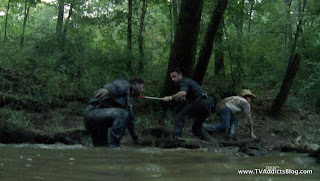 Shane said that when he saw Rick was alive, he wished he was dead. And it wasn’t just because of their affair, but because Rick didn’t have the stomach for what was to come. He asked Lori how many times Rick has saved her since he’s been back. 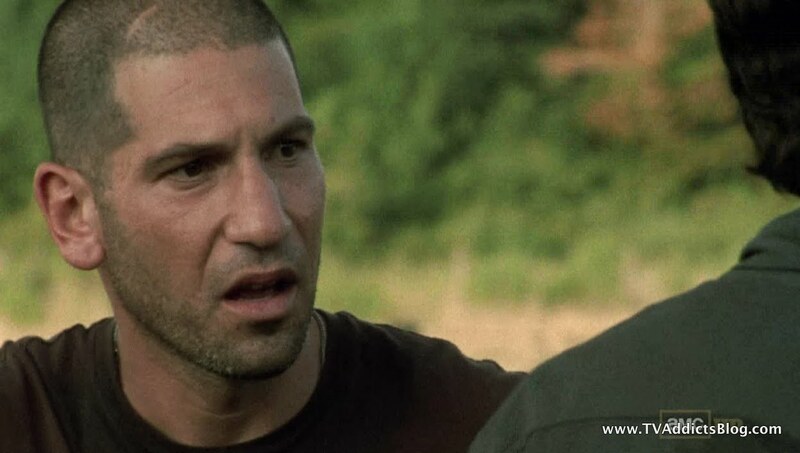 Shane counted that he saved Lori and Carl 4 times now and Rick has done 0. 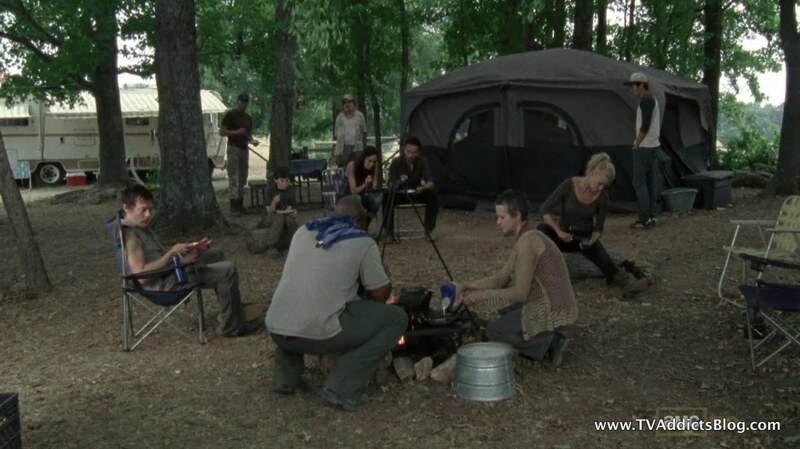 Lori brought up the fish fry, but Shane said that situation was caused by Rick going after Merle. 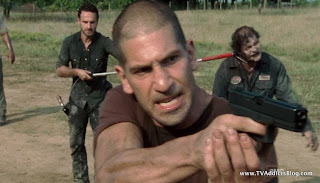 Umm..Shane, what about the guns that you’re about to use in the end of this episode? 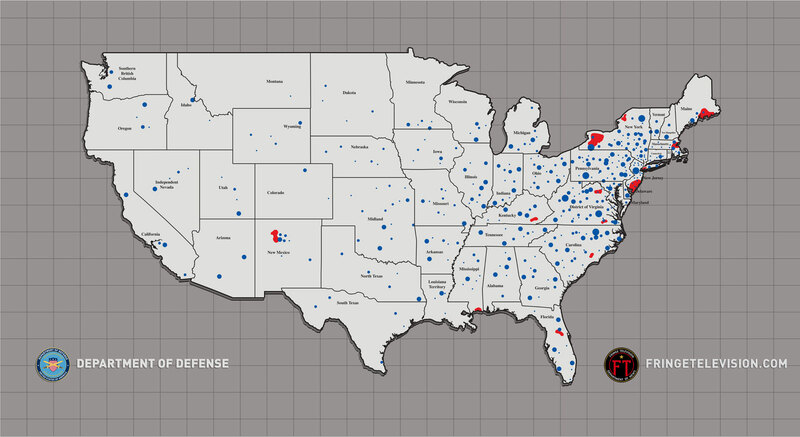 Where would you have gotten them? Anyway, Shane blames the deaths of Jim and Amy on Rick. And on top of that, he brings up Lori’s pregnancy. It would appear that Lori wasn’t 100% sure who the actual father is. Shane assumed Lori didn’t tell him because she figured it was his. But Lori said regardless of who the biological father is it will NEVER be Shane’s. Ouchie. This seemed to strike a nerve in Shane. 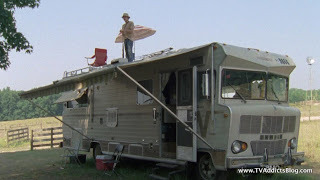 Shane walked with anger towards the RV but ran into Carl on the way. 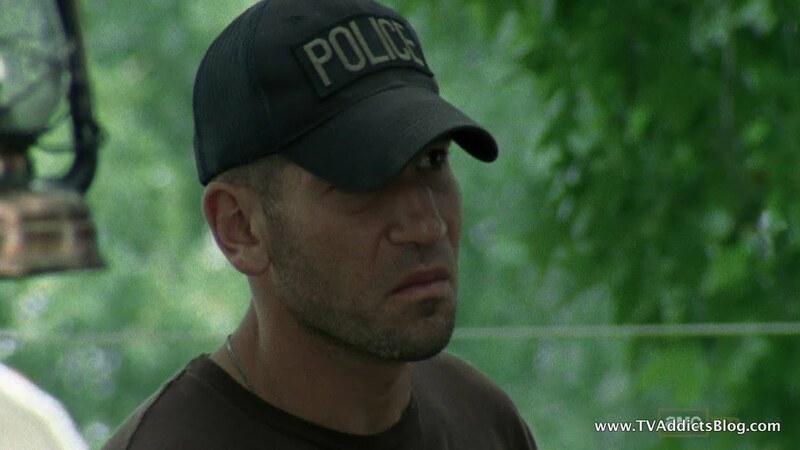 Sheriff Carl started dropping some profanity and telling Shane that they aren’t leaving until they find Sophia. Shane appeared to be responding by recruiting him for some Zombie killing but Lori calls him over before it gets too intense. To be continued. 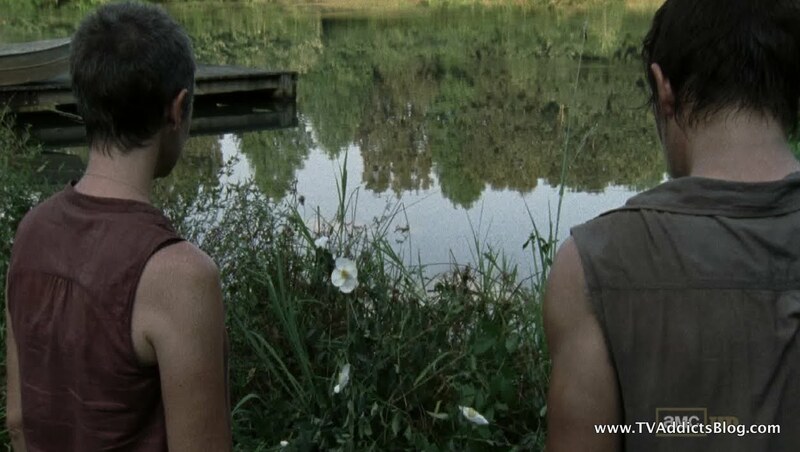 Daryl and Carol have a couple scenes in the episode too. 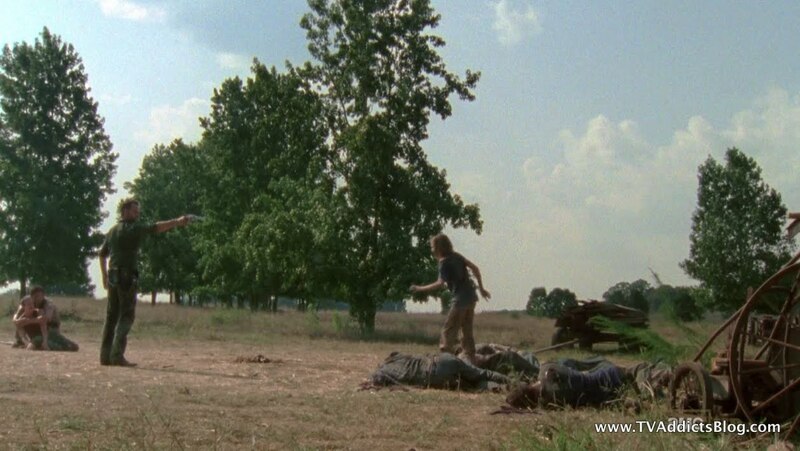 The first was Carol stopping Daryl from going on a Sophia search. He’s still recovering and she couldn’t bear to possibly lose Sophia and him too. This is hard for Daryl to swallow because he probably has never had anyone besides his brother care about him. (and his brother probably never cared for him openly and in the manner that Carol does) Was it me or did anyone else sense a brief flirtation/possible future romance here? Eh, I could be seeing things. 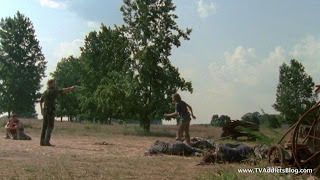 Anyway, Daryl responded in a very Sawyer-ish way by throwing a tantrum, hurting himself in the process and calling Carl a crazy B***H. Later on he apologizes when they find one of those crazy flowers again. He says he wants to keep looking for her because he thinks she’s still out there and has nothing better to do. Carol then proclaims that they will find her. Oh yes you will Carol! 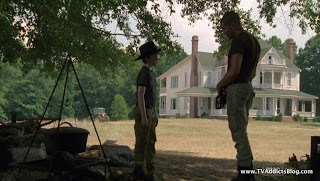 So, farmboy kid told Hershel, “It happened again” and sends the 2 of them scrambling to recruit Rick for help. Rick was planning to head out with Andrea but the search had to be called off for this. 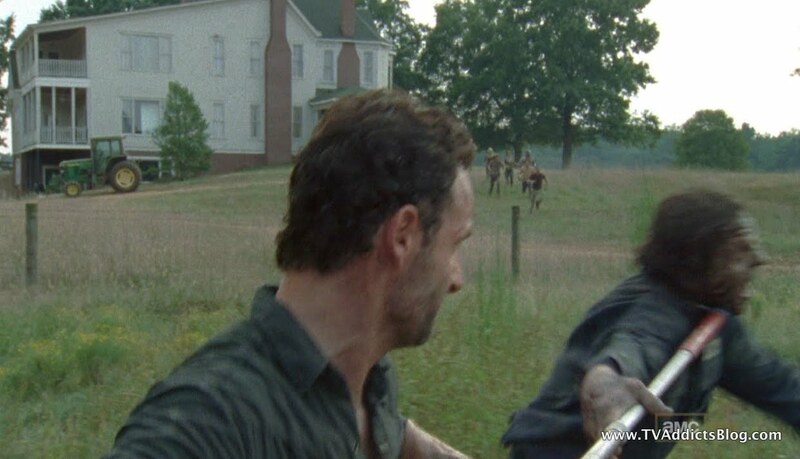 Rick goes with Hershel and Farmboy dude and they come up on a couple walkers. 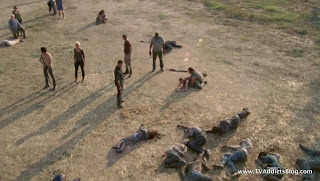 Hershel asks how many of these diseased folks Rick has killed, to which he admitted too many to count. He then asked Rick if he can stop. Apparently, it was Otis’ job to rope in these walkers and bring them to the barn keeping everyone else in complete denial of what was going on. 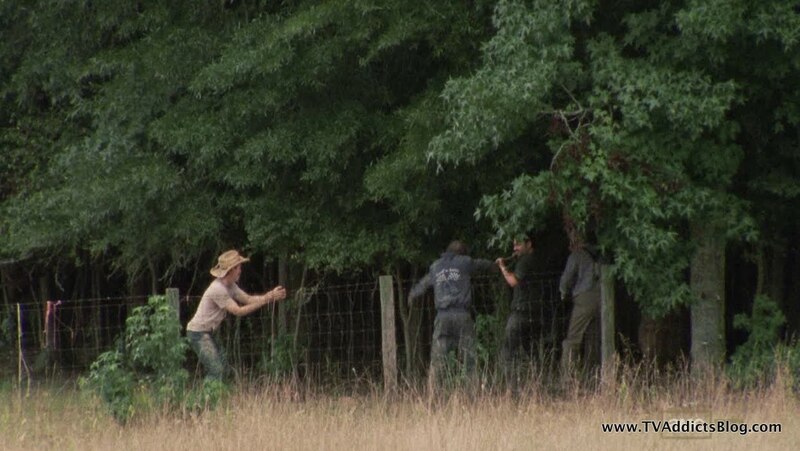 And now Rick is being asked to not kill these walkers (Hershel’s former neighbors) and help him bring them to the barn. In an effort to earn some points with Hershel, he agrees to try this. 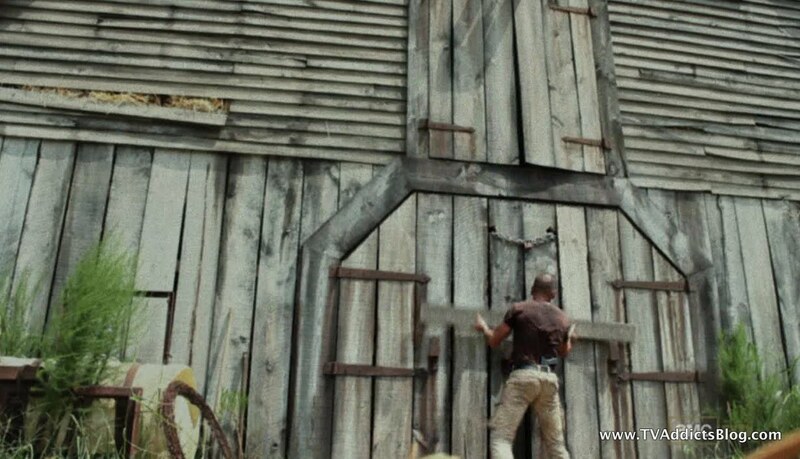 Meanwhile, Shane has been on a rampage looking for the guns. 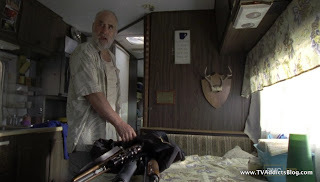 He noticed they were no longer in the RV and asked Glenn for some details to where Dale is. He figured out exactly what happened and put his tracking skills to use. 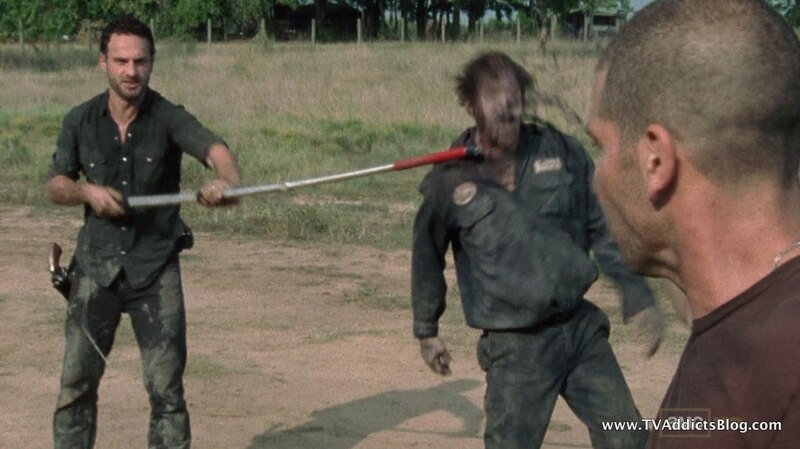 I’m sure all of us feared for Dale’s life once Shane stumbled upon him (well, unless you’re a Dale hater!). Dale did get a good line in about if Shane used his tracking skills to find Sophia maybe they would have by now. Shane demands the bag of guns from Dale. He does not willingly give them up at first. 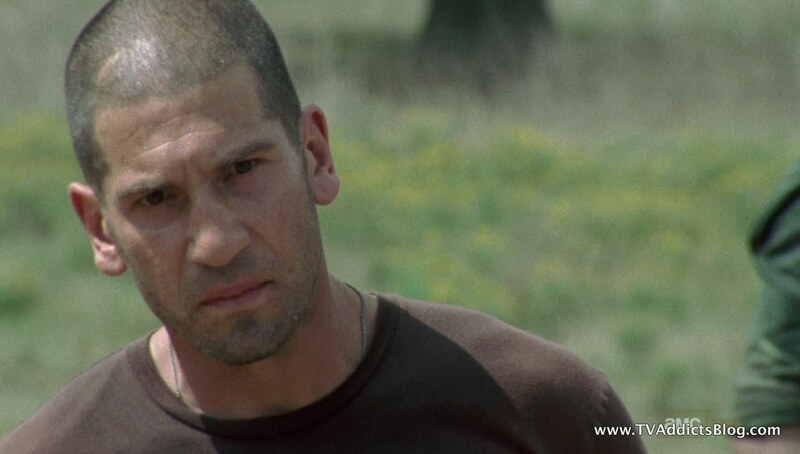 He brings up Otis again and asks if Shane will kill him too. Shane says that Dale is pretty much dead already (could have been a reference to his age and/or his mindset for this new world). 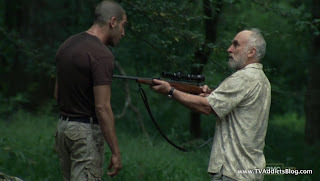 Dale raises his rifle at Shane but you could tell he didn’t have the guts to pull the trigger. He asked Shane if this is what it would take to stop him. Shane walked right up to the gun and said yes. Dale gave one more speech before handing the guns to him. “I may not have what it takes to last for long, but that’s okay. At least I can say when the world goes to sh*t I didn’t let it take me down with it.” Shane laughs this off with a “fair enough” and heads towards the farm. Shane starts preaching to the group who are all assembled outside of the farm. 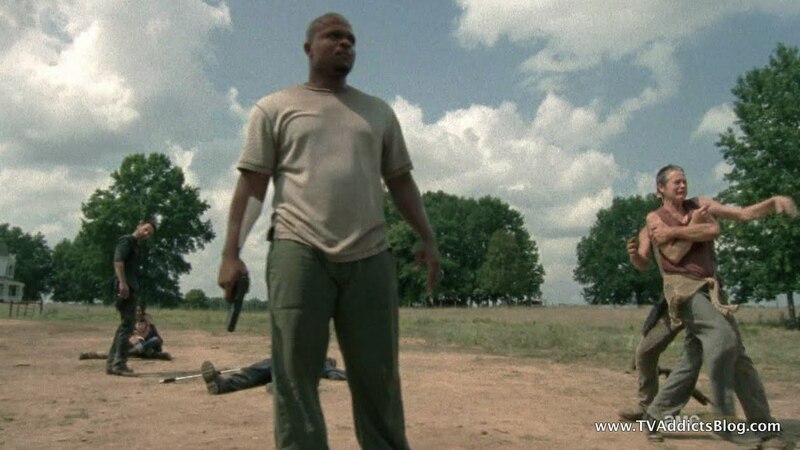 Daryl, T-Dog and Glenn all take guns when Shane hands them out. Maggie begs for him to reconsider. But the negotiation was at an end as far as Shane was concerned. 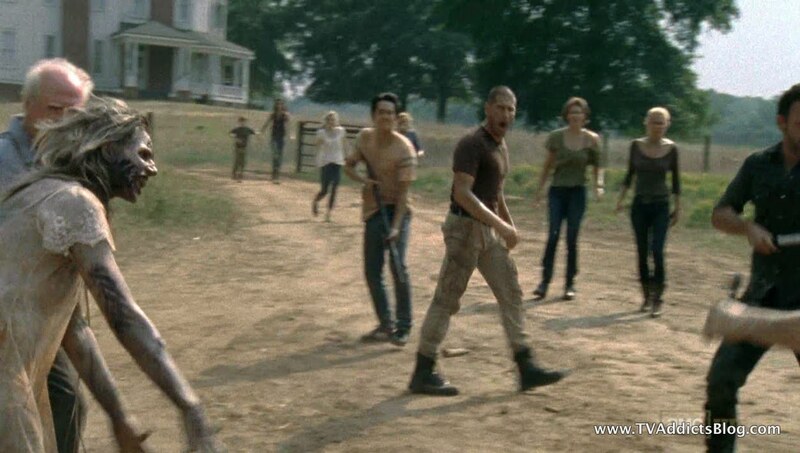 The walkers are a threat and they need to be dealt with. He tries to hand Carl a gun to protect his mother, to which Lori flips out. She defends Rick’s choices one more time saying that this is not Shane’s call. And then it happened. 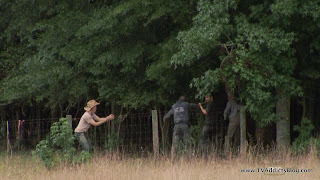 They whole group sees Rick with Hershel dragging Walkers out of the woods. 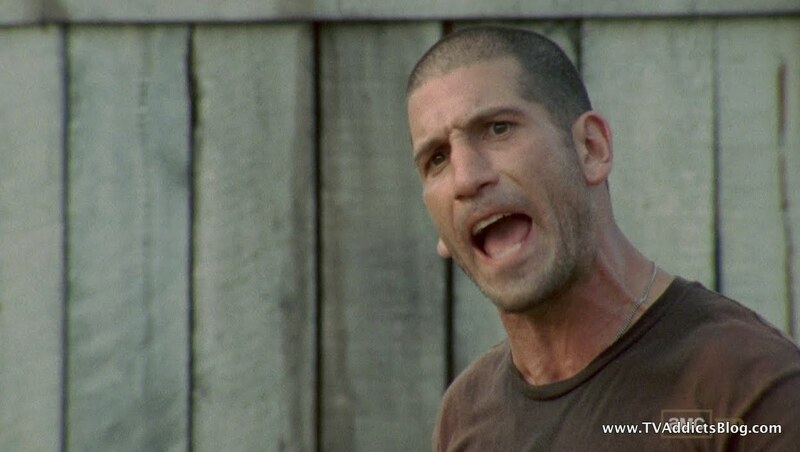 Shane loses it and goes into “anger run” mode! 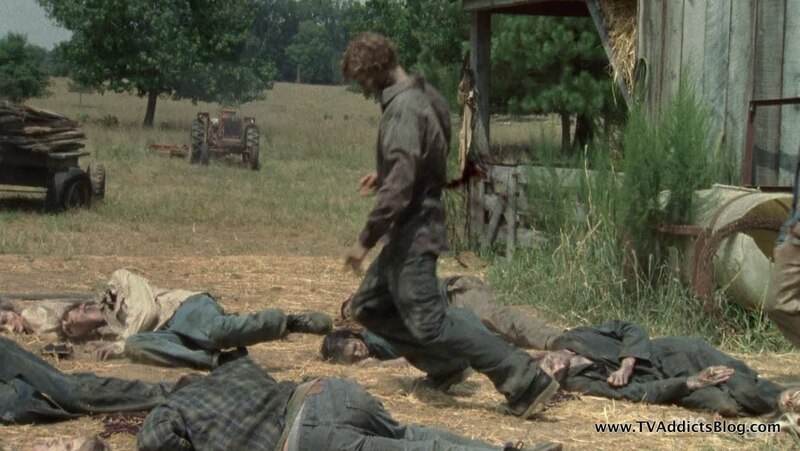 He starts pacing around them and yelling for Hershel to wake up. He tries to prove that the Walkers are dead by shooting Hershel’s neighbor in every vital organ possible. “How can it still be waking!? !” Rick exclaims that that’s enough to which Shane agrees. He pops a cap in the neighbor’s head sending her to her 2nd death. 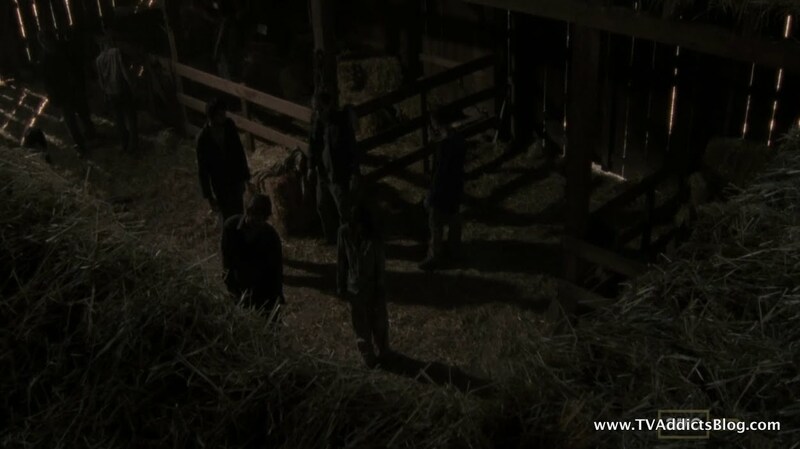 Shane then says they need to fight for life and runs to the barn and starts taking an axe to the locks. 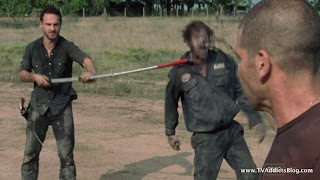 Shane yells at an “in shock” Hershel to take the reins on his walker so he can go after Shane. 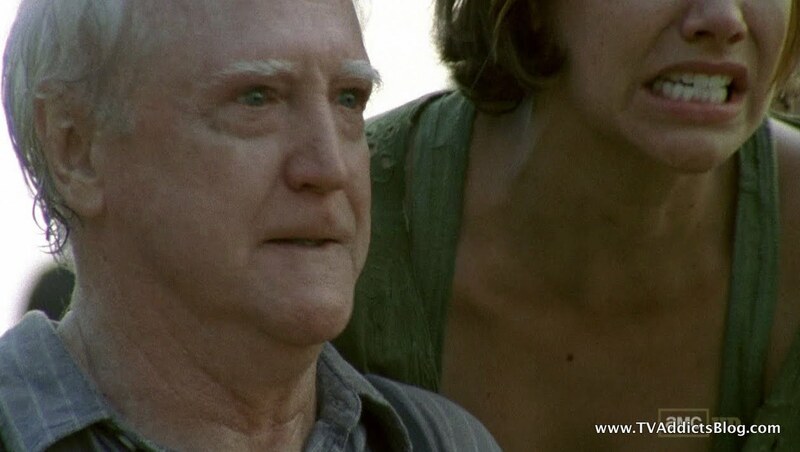 All Hershel can do is sit in shock at what he just witnessed. Oh just wait, Hershel, here comes some more! 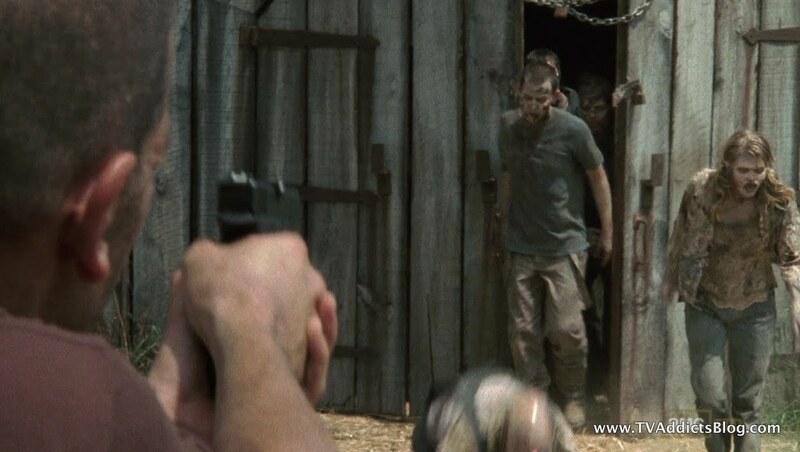 The barn door has been opened, and the gunners start lining up to take down Hershel’s family one at a time. 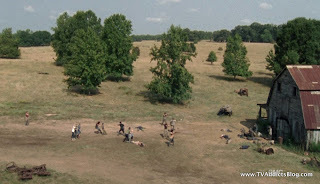 The Walkers were a little bit more humanized for this assault and we couldn’t help but feel a little sorry for the Greene family. While Maggie was in tears, she allowed Glenn to take part in the slaughter. One after another, the walkers fell until there was seemingly none left. But, I had a nagging feeling there was one more that would be walking through those doors. They waited long enough for the reveal for me to think that maybe it wouldn’t be happening. But as soon as that “walker hissing” sound started, we all had to know who it was. Suddenly, it wasn’t so hard to identify with Hershel’s desire to keep his friends and family “walking” around that barn. Shane didn’t even have the stones to pull the trigger on Sophia. She was a walker, but there was something about her that seemed almost human and alive. Carol was held back by Daryl and in tears. Carl had his infamous “cry” face on yet again. The whole group was in shock. Lori begged Carl not to watch. Their fearless leader knew what he had to do. 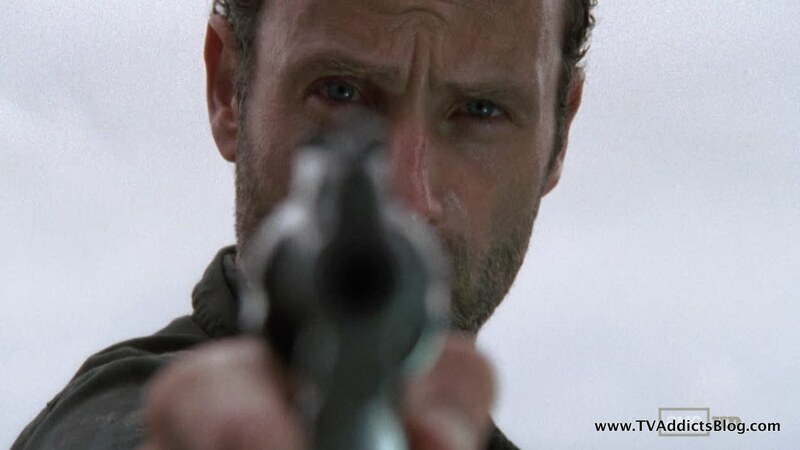 Rick walked up to Sophia and pulled his gun up on her. He probably recalled his promise to her about coming back for her and his inability to fulfill that promise. And then he did what needed to be done. He delivered the final blow. And that is where we end this mid-season of The Walking Dead folks. It’s been one crazy ride! It’s hard to believe we still have another 6 episodes to go! Where will it take us? Who knows? But if one thing is for certain, we can throw the official TV Rulebook away! I know I rambled on episode after episode that they’d obviously find Sophia at this point. It wasn’t until last week that I started doubting it. And I had the misfortune of reading someone’s theory that seemed so plausible that it was most likely a spoiler but it made the end no less shocking or emotional for me. Great episode of television. Great show. I’ll certainly be there when it returns! Can’t wait to hear your thoughts on the episode! Hope you enjoyed my ramblings and I’ll see you next year! I think the issue now is with Hershal obviously KNOWING he at least POTENTIALLY had Sophia in the barn and that he still allowed people to risk their lives to go find her..no matter how he saw the zombie "sickness"
AUSW - I totally agree it was a great ep and probably the best of the season. I do think that the preceding episodes were necessary to set it up though, as I mentioned! 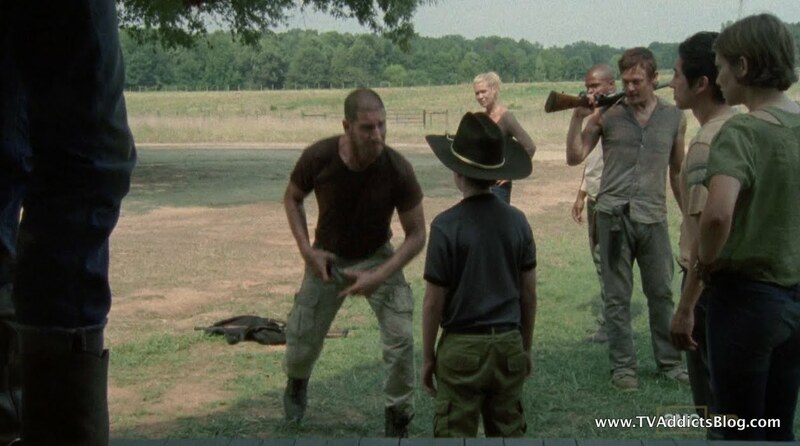 Obviously Shane has the right frame of mind to survive the zombie apocalypse. But for the entire community to turn off their "humanity" sensors right off the bat would be fairly unrealistic. (not that a show about zombies is currently something that could exist in the real world! 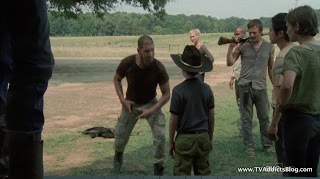 lol) I loved Shane's "does this stop them" scene. 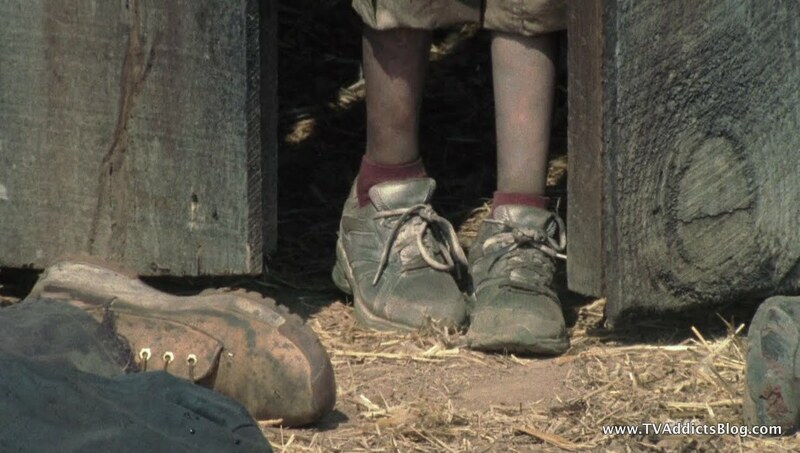 I didn't really think about proving without a doubt that these things are no longer living to Hershel. It was pretty vivid proof! It's a good point. 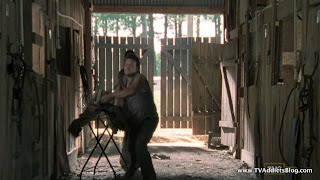 Even if Hershel didn't know for sure that Sophia was in the barn, he must've known that she potentially was in there and didn't reveal that. 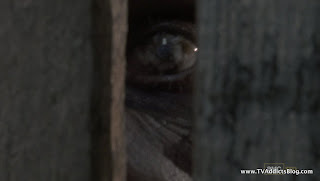 Per that interview with Kirkman, it seems that we will know very early into episode 8 how much Hershel knew so we won't be in the dark too long. As far as Jenner's whisper to Rick, they have stated it will definitely be revealed this season. And since I know what you THINK it is (don't want to spoil for everyone else), I would agree that it would go a really long way...at least in proving to Hershel that the world has changed and they need to change with it. Thanks for explaining why Hershel may not have known that Sophia was in the barn. Seemed like a major plot hole at first. But I'm not so sure the lady feeding the walkers wouldn't have noticed a young girl. I definitely thought it was a great episode! 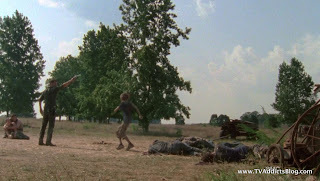 Good move on Shane's part, shooting the walker several times to prove that they were really no longer live human beings. I can't wait to hear Hershel's reaction to all of this! 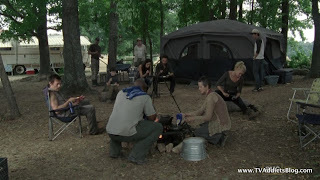 I suspect that the gang will be moving on -- I can't imagine Hershel allowing them to stay there after the massacre of his family, even if he is in denial that they were only "sick", I just don't think he will want the constant reminder of this around. It's time for them to move on. No problem on the Hershel thing. Actually, I originally was thinking that maybe Hershel was withholding information from the group about Sophia. But, then Kirkman threw that other tidbit on that show that the exchange of information was missing because Shane killed Otis. 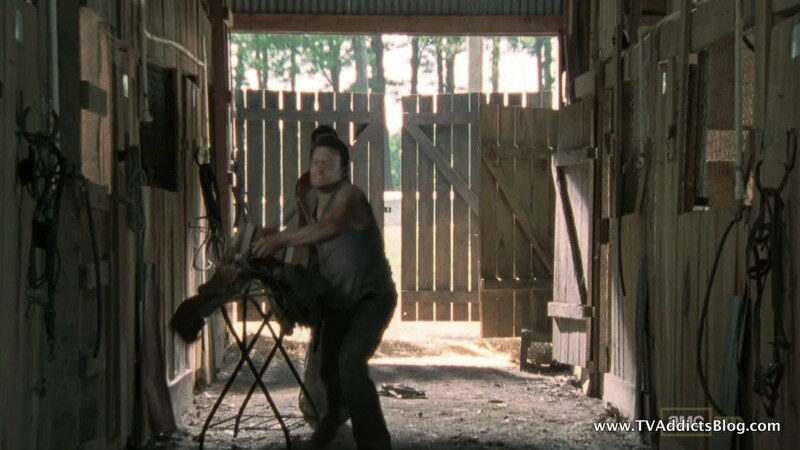 But, based on the fact that Hershel had Otis pulling walkers into their barn from the surroundings, I would imagine he must have considered the possibility that Sophia could be in that barn. Guess we'll find out! The comments we are referring to is Jenner from the CDC, yes. 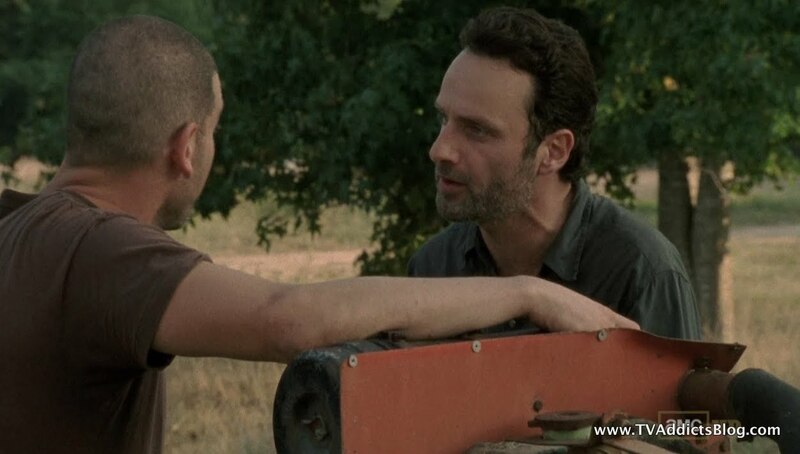 He whispered something to Rick right before the group left. Rick brought it up again in the season premiere when he was calling out to Morgan one more time. But then right when he was about to say what Jenner told him, he said "it doesn't matter".....AUSW discussed his thoughts on this offline....and I think he's right that it's most likely going to be what the whisper was all about. He has been reading the books too and this was a reveal in the books that I already knew about. I could see it definitely coming into play and impacting a few things that have already happened this season. I don't want to give it away, because I'm sure it's a big reveal. I'm sure the gang will be moving on, but according to those interviews, we should be meeting some new characters soon (also mainstay characters that are in the book). I'm sure Hershel will have some reflecting to do after what has happened. As far as allowing/not allowing them to stay? That I don't know. For all we know...all of those gunshots may have attracted walkers from the surrounding area. They may have no choice but to leave! But yeah...they definitely need to move on soon. I wasn't sure if ALL of season 2 would be at the farm or if only part. Guess we'll find out! Whew ! I've been incommunicato for quite a while now. Way behind on commenting - but not the watching of all our shows. What a great ep ! I was blown away (no pun intended) by Shane's scene. Happy the whole Sophia thing is over now - but so sad for her mom (who's name is eluding me now). You can never see enough brains being eaten! Andrew Lincoln does an excellent job playing his role, definitely a must see. The rest of season two is scheduled to air early next year. The season did start out a little slow but the mid-season finale left me without words by the end. I do work for DISH Network so I’ve been enjoying this show on AMC in HD and the special effects look great. I was expecting Shane to go off, but did not expect Sophia to come out of the barn like that. AHS - hah ! I knew Tate was rubbersuit man. I was disappointed a few weeks ago when Tate took that hood off and the showrunner said he was just wearing the suit to scare Violet. I'm one behind on Dexter myself Mike - so we won't discuss that one. TWD - Yeah, once I remembered about the mid-season finale, I kinda figured it would provide the Sophia resolution and maybe the beginning of the end of their farm stay. We'll see on that 2nd part! I just think it provided some great chances for character development. They even mentioned this on Talking Dead. They didn't have time to delve into each character with 6 episodes in the first season (though they still did a great job bringing them all to life!) so they wanted to take that opportunity with this season's 13. Are you referring to the Governor? (I think he's a well enough known character from the books to mention him lol) I don't know much about his story so I had no idea if he ran the farm or not. Of course, if the Governor ends up being Merle, I can't see how he would have taken charge of the farm. But you could be right, their stay on the farm could just be beginning. I have no idea. But I do know we're going to meet a bunch of new characters in February. And if this is in line with the books, it's going to make some of those fans happy. DEX - yeah, something tells me I'll be catching up when the season is over at this point, but we'll see! Maybe now with Walking Dead on hiatus, we can start fitting it into our Sunday watching! I actually laughed out loud about the Tate reveal since the showrunner managed to misdirect us as I mentioned. But if rubberman is just a ghost why would the child be some ghastly creature that the nurse saw !?! That is the real question. Still weird to me that Tate does not know he is dead. He knows he can only leave on halloween, but he doesn't think he is dead ? Agree - the ghosts all banding together was really creepy. Now I don't remember if this was last week or the week before since we didn't get to talk about it but Vi lying to her dad and getting her mom sent away was just so sad ! Poor Vivian. Moira was so adamant that Viv should leave - so maybe her being in the loony bin will be a good thing ? Totally agree on Tate. Once we found out he was the rubber man though...I started to get the feeling that he may know he's dead. Does he just think all of these random people live in the house with them? And why would he think that it's cool for him to live with this random family and all of the random families over the years? There has to be a part of him that knows. I dunno. Yeah the daughter lying was pretty rough!! I was upset that The Walking Dead is at the mid season finale! I wanted more and I was at the edge of my seat. The climax at the end has left me wanting to see what’s next. How is the group going to react now? 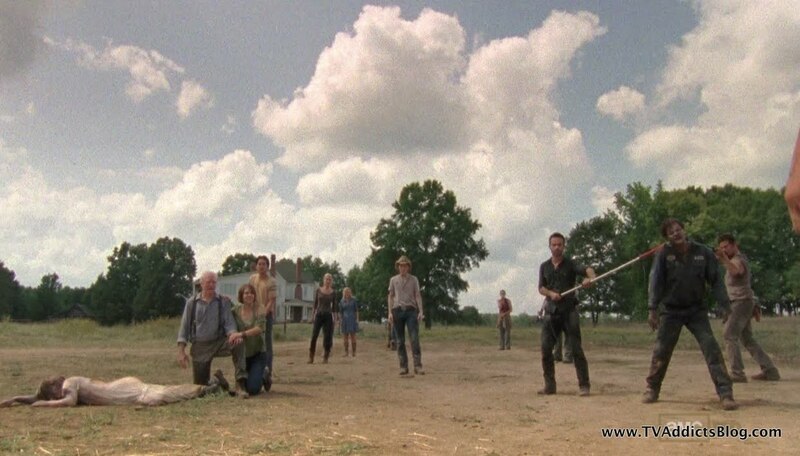 What is to happen with Herschel, and is he going to kick them off the farm? I think that the development of the characters was great being a drama. 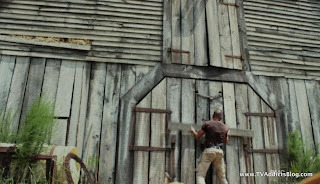 I am still talking about the end when Sophia comes out of the barn. I had this feeling of sadness and surprise that it was too late for her. I think that the writers did a great job in the way it ended. Will we be looking at a darker side of the characters? 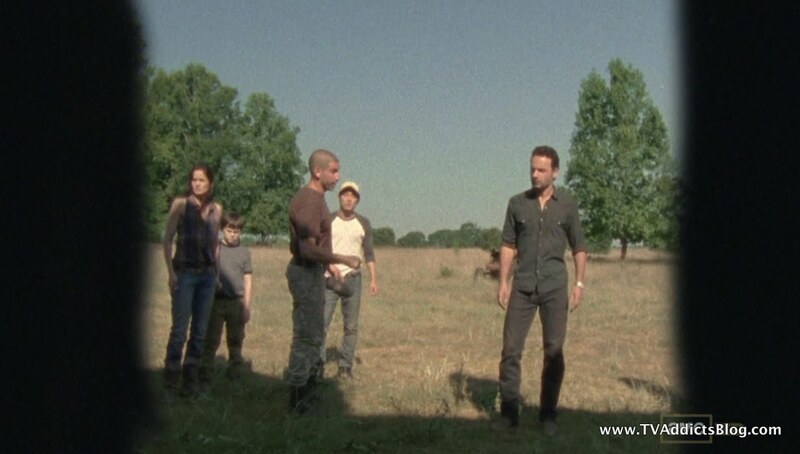 Will the group be more like Shane, who has come to the point of it’s all about survival? I know that when this series continues I am ready to see what happens. I have to give a big thanks to the Sling adapter I purchased connected to my employee service from DISH. I get to watch TV on the road, park, and even the airport. I can use this to see live TV or right off my DVR. I suggest this to all. I have been able to watch more TV now than I ever had before. Don’t miss any of your favorite shows or games. This is also currently offered from DISH for free to new customers. Take advantage of the limited time offer. Over the last week, I was finally able to dedicate some time to watching these 13 episodes from the beginning. I admit that I first recorded this show because I was curious after seeing the previews during Mad Men. I’m not much of a zombie fan, so the episodes have been sitting on my DVR because they were a low priority for me. This year, I ran across some of the comments on this show while I was looking for AHS comments and decided it was time to give it a chance and not pre-judge it because of the zombies. I was also someone who thought, “How could they keep a show interesting about a bunch of people who crashed on an island. ?” Need I say more? LOL! I have really enjoyed this show so far! I read your recaps and the comments on each episode as I went along. Mike, I agree with you saying that they really had a great pace for the first season, and we got right in there with these characters and cared about them and their struggles. This is really a character driven show, and it really doesn’t matter if they are surviving the zombie apocalypse or a plane crash on a mysterious island. They are figuring out how to live together, or they will die alone (or maybe in a herd, but it won’t be pretty)! :) What’s important is that they make us care about these people. I will also say they do a great job with the appearance of the walkers and with the gore. I have cringed many times! Like you, Mike, I was initially thinking Sophia was alive, but the longer it went, the more I thought she was dead, but I didn’t expect her to be in the barn all that time! 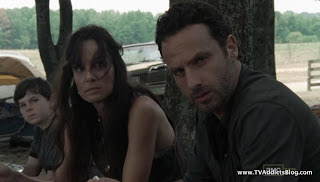 The whole Rick/Lori/Shane storyline is heart wrenching. Andrea going to the dark side is a little scary. I understand the need for changing the rules for survival, and not wanting to be a victim, but she seems to be getting too much pleasure from the killing. I agree with you that there was something there with Carol and Daryl. An unlikely pair, but maybe they need each other. Once again, I thank you and your readers for all the comments you share, and I look forward to keeping up with this show when it comes back in February. Happy New Year! I know you are on baby watch, and I look forward to seeing your post on the new addition to your family! Best wishes to you and your wife! Leslie, so excited that you caught up on Walking Dead and you make many excellent points on the show! I may eventually be able to come back and discuss them or we'll just catch up on episode 8 of this season but great job catching up! As far as baby watch, that is all over. :-) He came on 12/29 and is absolutely precious! I'll get up an announcement soon. Hope you had a continue to have a Happy New year as well! "And I had the misfortune of reading someone’s theory"
Thanks for the heads up Marco. I'm well aware of how TWD is following the basic stories/settings of the books and I sometimes know things ahead of time. But for the whole "sophia in the barn" thing...that was not in the books and I just read someone either theorizing or spoiling it on a website. I am reading the Game of Thrones books ahead of watching the episodes on TV so I'm totally cool with being spoiled by books. At least I am surprised the first time I read it and then I just get to see it play out on TV or in the movies.